Royal Air Force and Royal Navy fighter aircrews flew combat throughout the six long years of World War Two. At the outbreak of war in 1939 four RAF Hurricane squadrons and two equipped with Gladiators went immediately to France where in short time New Zealander "Cobber" Kain became the first Allied Ace of the war. In April 1940 Hurricanes and Gladiators saw in action in Norway, when Rhodesian Caesar Hull of 263 Squadron became the second air Ace. By the fall of France the new Spitfire joined in the great air battles over the Channel as the British Expeditionary Force evacuated Dunkirk. Bob Stanford -Tuck, Douglas Bader, Peter Townsend, Sailor Malan, and many other great Aces gained their first victories, but with German forces massing on the French coast, the invasion of Britain looked imminent. Only RAF Fighter Command stood in Hitler's way. By July, the most famous of all air battles had begun. The next three months, under glorious summer skies, saw the most decisive and continual aerial fighting in history. The British victory in the Battle of Britain was to fundamentally change the course of the war and, ultimately, the course of history. But there were four and a half more years of air battles still to be fought and won -from the English Channel Front to the North African desert, from the Mediterranean to Far East Asia. It fell to Fleet Air Arm pilots to see the last air fighting for British and Commonwealth pilots, by then equipped with Seafires and American Corsairs and Hellcats, as they took part in the final assaults on the Japanese mainland. As the last embers of hostilities faded into history the centuries old doctrine of maritime supremacy had gone. Now the aircraft ruled. In his masterful painting A Time For Heroes Robert Taylor pays tribute to the World War II fighter aircrews of the RAF and Fleet Air Arm. A panoramic scene from the era of the Battle of Britain shows Mk I Spitfires of 234 Squadron, 10 Group's top scoring squadron, returning to St. Eval after intercepting heavy raids on south coast ports during the heaviest fighting, in September 1940. 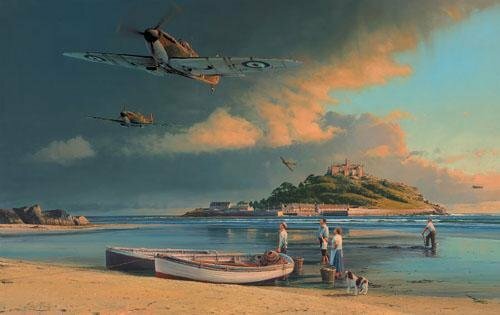 St. Michael's Mount, the castle built on the site of a 14th Century monastery to defend Britain's shores from earlier enemies, provides a symbolic backdrop as once again a band of brothers is called upon to defend their Sceptred Isle. Overall Print Size 31" x 23"